If you are fortunate enough to live in the Netherlands it’s possible to operate a BTS in guard band situated between GSM and DECT allocations, license free, provided that transmit power is limited to 200mW and antenna height to 10 metres. And this is precisely what Fairwaves did in August 2013, when together with Event Connection they built a GSM network that covered the city of Nijmegen. Similar license-exempt use is also permitted in Sweden and possibly some other areas — but these are the exception to the rule. While access to guard band spectrum is permitted for low power use in the UK, this is limited to those 12 licensees who together paid Ofcom £3.8 million for the privilege and were awarded licences back in 2006. Regulatory authorities typically provide a class of licence that can be used to support the development and testing of wireless technologies. Here in the UK this is referred to by Ofcom as a Non-operational licence, and was actually previously known as a Test and Development licence. These may be valid for up to one year and currently cost £50 per site. is a privilege and not a right! Applicants will be expected to provide details such as the requested frequencies, modulation type and bandwidth, transmitter power level, and antenna gain and height. Those without a background in RF systems may find answering some of the questions a challenge, however, a solid understanding of the fundamental basics is essential. There are no hard and fast rules when it comes to what power levels or antenna gains etc. will be permitted under a non-operational licence, but note that requests for access to spectrum are subject to approval by primary users. Applications should be driven by need, common sense must prevail, and a few milliwatts TX power and a low gain antenna should suffice for bench testing. Contact Ofcom when uncertain — they are most helpful. Note that regulators in other countries typically provide similar licensing schemes that can be used to support research and development. Lighter regulation for guard band spectrum, such as has been employed in the Netherlands and Sweden, would provide a great many benefits beyond simply facilitating the development and testing of wireless technologies. For example, SMEs and communities could use it to provide network service in rural and sparsely populated areas that have been deemed not economically viable by the incumbent operators. However, this topic is one that requires a blog post all to itself! 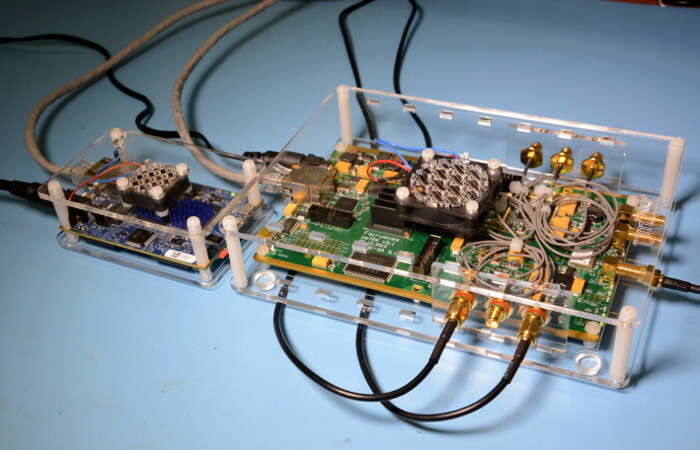 Top image: bench testing a Parallella board running the Osmocom software driving a UmTRX.